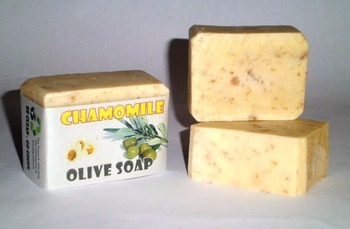 Natural Chamomile Olive Soap, is made of olive oil and essential oil of Chamomile. Oil oil makes this soap gentle and mild and works as a skin moisturizer. This kind of soap can be used as hand soap, a bathing soap and also as a natural shampoo bar. This soap is enriched with chamomile oil. Chamomile essential oil has active ingredients that are anti-inflammatory and good for soothing and cooling the skin. The soap helps protect hair from harsh external environment; and relieves oily scalps which cause dandruff. Olive-Chamomile Soap is good for lightening, revitalizing, and strengthening the roots of your hair.